Our boarding kennel for your K9 companion is an indoor kennel. Heated in the winter and air conditioned for those "HOT" days of summer. We offer a large play yard, with many upgrades coming, for your pet to enjoy lots of play time and have potty breaks. While inside your pet can lounge on a raised pet bed and listen to music on the radio. A large screen television is our hope to be another addition soon. Our feline companions are boarded in a seperate facility so the noise of barking dogs does not cause any added stress. Kitties are each given a 3 tier suite with many amenities. Heated in the winter and air conditioned in the summer. If you have more than 1 kitty they are more than welcome to share a suite. Here at the Cat's Meow and Hound's Hideaway, we feel the health and well being of our furry family members is a crucial part of their happiness. This is why we pride ourselves in tending to the mental and physical needs of all pets in our facility. At no additional charge we are happy to administer any injectable, oral, or topical medication your pet may need while staying with us. We are happy to assist the blind or the lame from place to place, or just simply spending much needed time with our more nervous visitors. Each dog is given their own inividual interior kennel (depending on size) equipped with a raised bed, blankets, dishes, food, water, and optional treats and toys. You are welcome to bring in your pets own bed, food, or toys if you feel this will help to make their stay more relaxing. Please be sure to mark all items with their name to ensure it returns home with them. We let each dog outside in the play yard individually to spend time exercising 4 to 6 times a day depending on weather and the dogs own personal needs. We supply Nutro Max adult food. We are more than happy ot feed your pets regular diet if you prefer. Just bring it in with you in a marked container. Every cat will have its own three tiered condo with a window leading to a personal exterior cage that is elevated off the ground. You have the option of an open window or closed window during the warmer days and months. 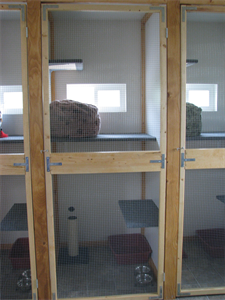 Each condo comes with dishes, food, water, litter, litter boxes, and blankets. If you would like to bring anything from home you are more than welcome to. Please mark any items you bring with their name so we can ensure they go home with you. We supply Nutro Max adult cat food but again, you are more than welcome to bring your pets own food. There is a 10% discount for any K9 or Feline who boards with us for 30 days or longer. Copyright 2017 The Cat's Meow & Hound's Hideaway. All rights reserved.